During the War of 1812, Colonel James Findlay built a road to transport troops across the region and constructed a stockade that was named Fort Findlay in his honor. The community of Findlay began to emerge in the area surrounding the fort after the war was over. In the years prior to the Civil War, Findlay served as a stop on the Underground Railroad for slaves escaping to Canada. In the mid 1880s, the community gained national attention when natural gas and oil were discovered nearby. Although the gas wells were soon depleted, the oil wells continued to provide income in the area. 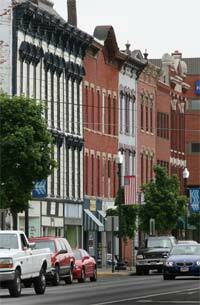 Numerous other industries emerged as Findlay’s population grew quickly during this era. The town boasted several newspapers, including one printed in German for the German immigrants in the community. There were a number of glass manufacturers, ranging from window glass to table glassware and bottles. Findlay also was home to several woodworking firms and furniture manufacturers, a woolen mill, brick manufacturers, and a company that made typewriters, among other businesses. The University of Findlay is also located in the community. On January 28, 1882, the Church of God and the city of Findlay, Ohio, established Findlay College. By 1897, the college had established an endowment of more than 100,000 dollars and boasted 16 faculty members. 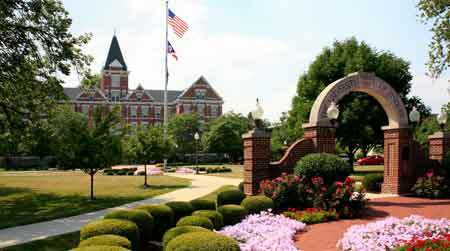 In 1989, Findlay College became known as the University of Findlay. By 2000, the institution boasted 65 different areas of undergraduate study and 8 graduate programs. The university is especially well known for its equestrian studies program and offers equestrian riding as a varsity sport. In 2005, more than 3,300 undergraduates and 1,200 graduate students were enrolled at the university, which also boasts a sizable international student body, representing 30 countries. Today, Findlay is known as “Flag City USA.” In the 1960s, a man named John Cooke moved to Findlay. Believing that every American should fly the American flag on Flag Day, Cooke worked to provide everyone in the community with a small flag. The designation was made official with a resolution of the U.S. House of Representatives on May 7, 1974. Residents of Findlay are still proud of their town’s nickname to this day. 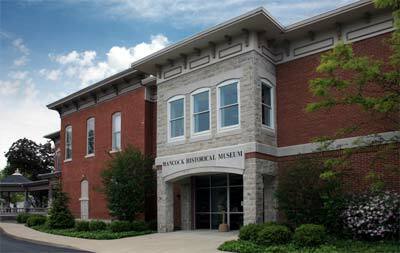 Hancock Historical Museum displays and collects information about Hancock County from prehistoric times to the present. Northwest Ohio Railroad Preservation is a non-profit organization dedicated to preserving and communicating information about railroading, from model trains to full size trains. 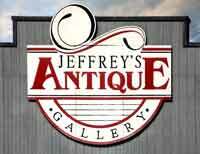 Jeffrey's Antique Gallery is called Northwest Ohio's largest antique shop. 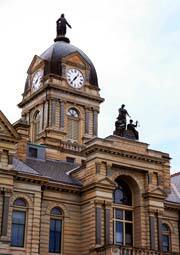 Located in historic Findlay, is home to 230 antique dealers in a very long building. Located just west of I-75 at exit 161. Old Mill Stream Parkway provides a scenic setting for a system of river parks, trails, boat access sites and historical areas called the Old Mill Stream Parkway. The meandering waterway extends 18 miles between Riverbend Recreation upstream to Blanchard Landings downstream connecting park areas, sportsmen access areas and hiking, biking and canoe trails. Blanchard River Greenway is part of the Old Mill Stream Parkway and represents a network of river parks and sites conveniently located along the Blanchard River within the City of Findlay. Blue Rock Nature Preserve receives its’ name from the heavy, bluish clay mined from the property in the early 1900’s. Remington Arms Company used the clay for their Blue Rock brand clay sportsmen’s targets. The strip-mined area has now been returned to a natural state. Oakwoods Nature Preserve was originally, a privately owned picnic and fishing area, Oakwoods is a successful community preservation effort. Grants and private donations helped the HPD purchase the original woods and lake in 1984, opening to the public in 1985. Railroad tracks and buildings were located in the area of the Richard S. “Doc” Phillips Discovery Center, but were destroyed by fire in 1916. The Discovery Center was dedicated and opened to the public in 1994. Check out a bathtub on display at the Hancock Historical Museum from the USS Maine, the battleship that was blown up in the Havanna Cuba harbor, and started the Spanish American War. The USS Maine was raised in 1911 and pieces of the famous ship were distributed to interested congressman. The bathtub was Captain Sigsbee's personal bathtub. Known as the "Flag City Balloonfest" this annual hot air balloon festival draws some of the top balloonist's from in the Midwest. 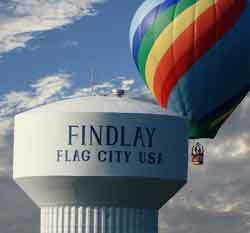 The event started back in 2000 when a father and son decided to invite other hot air balloonists to Findlay for a little friendly competition. The event is now one of Ohio's and the midwest's premiere hot air balloon events. According to an account published in Toledo's The Blade in 1999, Findlay most probably can lay claim to having been the location of not only having Ohio's, but perhaps the nation's first roadside pit stop and park. At the very least, it was Ohio's first such place of convenience. 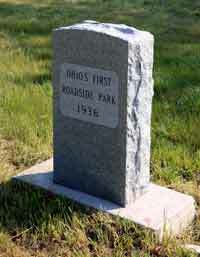 Today there is a simple marker designating the historic spot as "Ohio's First Roadside Park 1936" that was placed there in 1999 by the Ohio Department of Transportation. The rest area was closed in 1980 when costs to upgrade the facility exceeded $250,000. The marker is located on SR 68 just north of SR 15. According to The Blade, "Authorities believe it may have been the nation's first roadside park, because a historical text lists Ohio as having been the first state to establish a roadside rest program." James Findlay came to the Ohio Territory at age 23 with his new wife and settled in Cincinnati. He became a successful merchant. In 1802 he helped create a library and was elected as Cincinnati's Mayor in 1805 and 1810. After the war, Findlay elected to the US Congress and served as a Major General of the State Militia's 1st Division. Although James Findlay did not live to see one of his dreams come true, his wife made it possible that land he had purchased be donated to Cincinnati for the creation of a Market. Today, that market is still in existence and is called Findlay Market. James Findlay's widow, Jane, moved for a brief time to Washington DC to help her niece Jane Irwin, who was the newly elected William Henry Harrison's daughter-in-law, perform the duties of 1st Lady while Harrison's wife remained in Cincinnati packing for the move. She never made the trip as Harrison died shortly after taking office. James Findlay and his wife Jane are buried in Spring Grove Cemetery in Cincinnati.